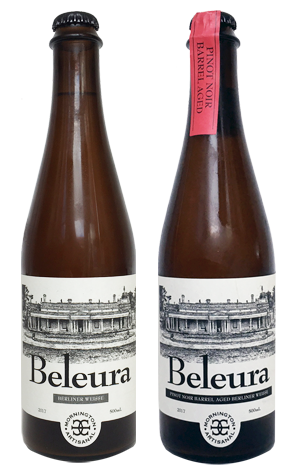 The second release in the Mornington Artisanal range features a pair of Berliner weisse style beers that, like its peers, takes its name from a well known location on the peninsula. In this case, it's Beleura House and Gardens, where the launch of the beers took place. And the reason for the release coming in two parts is that they took the base beer and aged some of it in locally sourced pinot noir barrels for a few months before release. The variation between the beers is subtle. Certainly, you'd be hard-pressed to distinguish the hazy, pale beers visually and both share the light, yet spritzy carbonation and acidity the helps define the style, not to mention hints of hay like funk. The straight version delivers some fruitiness on top too: stone fruit, grapefruit and lime alongside an underlying minerality. Its barrel aged companion is drier and replaces those citrusy characters with something deeper and more subtly spicy – "spicy cinnamon, apple pie and baked rhubarb" is the brewers' take. Either one (or both together) make for a smartly packaged alternative to bubbles to spring on people over the holidays.